Aside from the headline-inducing Dynamic Arrays from last year, there’s several quirky new features that have flown under the radar, which are in the very latest versions of Office 365 (e.g. Insider Fast), but most likely won’t be coming to Excel 2019. The old version had ‘Actions’ and ‘Help’; this latest incarnation also adds ‘Find in Document’ to the search results too. The keyboard shortcut ALT + Q still activates the new search box, just like its earlier cohort. Our initial reaction is whilst the extended results are welcomed, the revitalised search box is too big and too central. If you have a longer filename, you might not be able to see it all, for example. We’d love to see it go like Cortana, where the search box is less obtrusive, and the search box could be switched for an icon with a simple right-click. What do you mean, we’re resistant to change!? 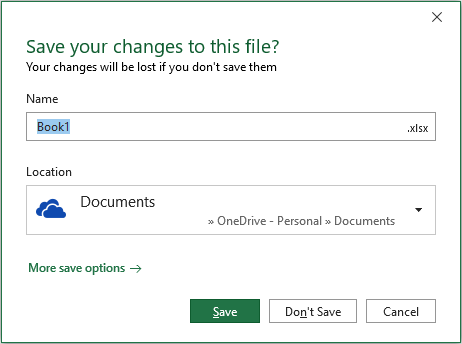 This dialog box is pretty much “in your face” and 99 times out of 98 appears to want to save everything to OneDrive, no matter which file directory you were working in (although it’s easy to change by either clicking on the dropdown arrow in the ‘Location’ box or clicking on ‘More save options’). The main criticisms here appear to be the above issue on OneDrive above all and the fact that the dialog box does not look like 99% of all Excel dialog boxes. So, it’s not just us resistant to change then. It almost makes me want to use it. ‘Help’ has been getting much more user friendly of late. Microsoft has a big push presently on regarding accessibility, and these new, improved ToolTips are definitely a step in the right direction. Now, what’s it to be? 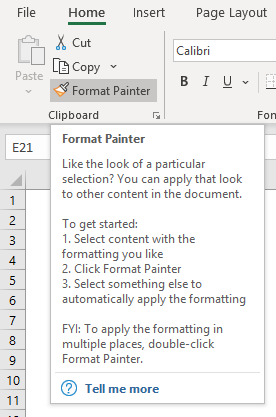 Excel 2019 or Excel 365?